Microsoft skips 9 for the "greatest enterprise platform ever". Microsoft has laid out details of its next version of the Windows operating system, which returns to the Windows 7 experience for several key features. At an event in San Francisco, Microsoft operating system group vice presidents Terry Myerson and Joe Belfiore demonstrated build 9841 of Windows 10, code-named Threshold. Belfiore made several references to Windows 7, which was well-received by users, and said the new operating system would provide a familiar experience. For Windows 10, the radically different dual user interface brought in by Microsoft in Windows 8 -forcing users to switch between tablet-style tiles and a traditional desktop - will be dialled down. Microsoft has introduced a new feature called 'Continuum', which will adapt the Windows 10 interface based on the type of device being used. Users will be prompted to switch between the traditional desktop UI and the touch mode when a keyboard is disconnected or connected. Microsoft said the feature was made with hybrid devices like the Surface 3 Pro in mind. It's one of several features in which Windows 10 will seek to win back business customers alienated by Windows 8, and which have doggedly refused to upgrade from Windows 7. Joe Alkove, Microsoft's Windows enterprise program management team leader, said "Windows 10 will be our greatest platform ever for organisations and their employees". He pushed familiarity as a key selling point for the new software. 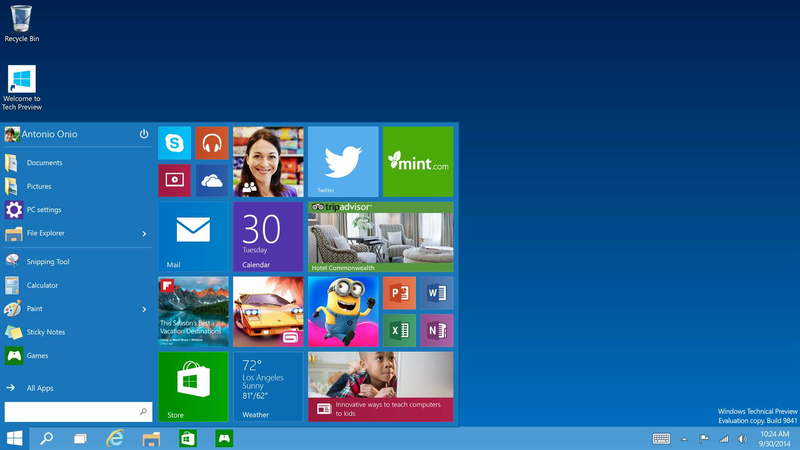 "There’s virtually no learning curve required with Windows 10," Alkove promised. Chief among changes in Windows 10 is the return to the familiar Start menu to access applications and files - this was removed in Windows 8 in favour of touch-oriented Start screen. 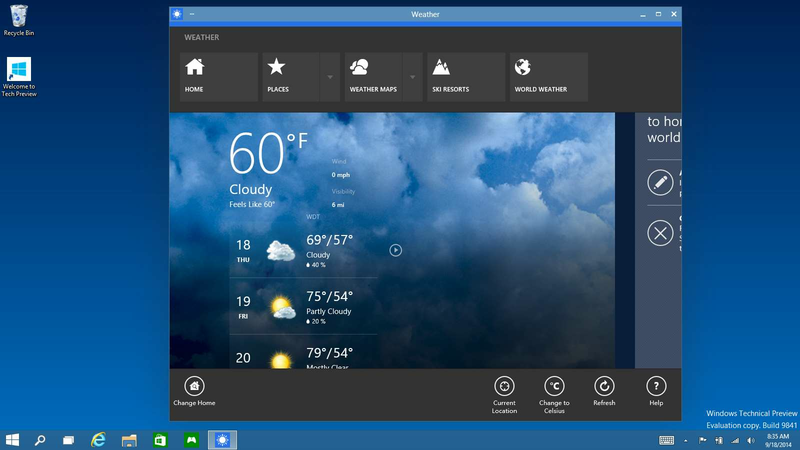 The Start screen will remain in Windows 10, but will only appear when the operating system detects a touch-display device. Windows 10 will keep the "Charms" command and navigation bars on the side of the screen that are hidden until swiped into view, but they are only active on touch-screen devices and not on traditional computers with mice and keyboards. Other new features includes a "quad snap" view allowing four apps to be snapped onto the same screen. Microsoft is also catching up with Apple's OS X. 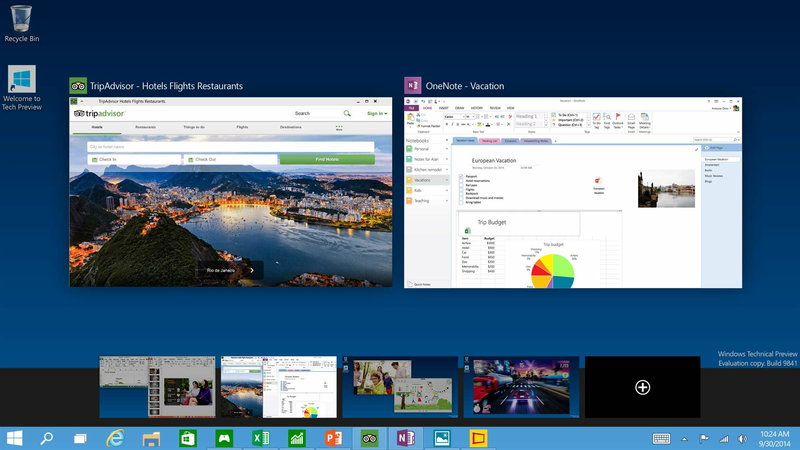 Windows 10 will have multiple desktops for the first time, and has built in an Expose-like task view button as well. Windows 10 will work across a range of devices including touch screen tablets and laptops, to desktops and all-in-one PCs, Microsoft said. In addition to returning Windows 10 to its Windows 7 user interface roots, Microsoft hopes to lure business users back to the new operating system with simplified management and deployment that makes device wipe and reload obsolete during in-place upgrades. Microsoft is also revamping its Windows Store to allow volume app purchases for organisations, including licensing re-use and reclaim. Kevin Gallo, the company's director for application development, said there will be one Store for all devices. Gallo also said the Universal Windows concept that allows developers to leverage the same code to deliver appropriately tailored experience across multiple devices types will be the cornerstone for building Windows 10 apps. Windows 10 will come with security and identity protection improvements that guard against data breaches, device theft and phishing or social engineering attacks, Microsoft said, building in multi-factor authentication and token-based systems into the operating system. A technical preview of Windows 10 will be available to download tomorrow, and the new operating system is expected to ship in the middle of next year. Myerson and Belfiore warned that the preview would be very early code, and was for people who know that "DLL is not the new OMG" and "PXE boot is not a girl punk band". Gallo also warned developers not to use Windows 10 as their primary operating system for coding. He said the Windows App Certification Kit does not currently work on Windows 10. Furthermore, there are bugs in the tools that prevent Windows 10 from being used for "go live" software development. According to NetMarketShare, Windows 7 current holds 51.2 percent of the operating system market, while Windows 8 counts 13.3 percent. Windows XP, the version before Windows 7, still holds just under 24 percent of the market.